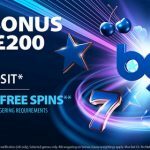 BGO Wimbledon Finals 2018 VIP Promotion – Stand a chance to catch the Wimbledon Finals LIVE! It’s Wimbledon Season and one lucky winner stands a chance to catch the Wimbledon Finals LIVE in VIP style! 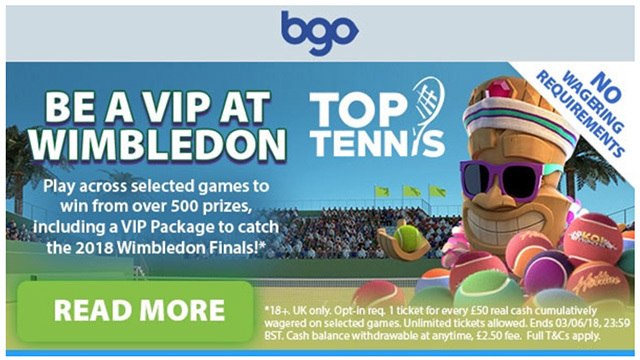 Yes, BGO Casino is running their BGO Wimbledon Finals 2018 VIP Promotion from now until the 3rd of June 2018. Take part in the BGO Wimbledon Finals 2018 VIP Promotion to win up to £6500 in cash prizes and of course, the ultimate grand prize – the VIP Package at Wimbledon! Please note that this promotional offer is only for players residing in the UK. UK players must remember to ‘opt-in’ to take part in the BGO Wimbledon Finals 2018 VIP Promotion. Deposit and wager £50 to receive one ticket into the draw. Players must play any of the eligible games mentioned below. Eligible games: Twin Spin Deluxe, Hotline, Archangels: Salvation, Koi Princess, or Jungle Spirit: Call of the Wild. The promotion runs until the 3rd of June 2018 (23:59 BST). Over 500 lucky players will then be drawn to win from the prize stash. So what’s the grand prize? What other prizes are up for grabs? UK players only. Players must be 18 years or older. This promotional offer is for UK players only. Players must be 18 years or older. Deposits made using Neteller or Skrill are not eligible for this promotion. Players must opt-in to take part in this offer. This offer will run from Monday 28th May, 00:01 BST until Sunday 3rd June 2018, 23:59 BST, with the Prize Draw taking place on Tuesday 5th June 2018 by 18:00 BST. 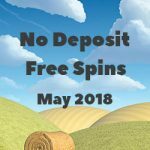 Posted in Bgo and tagged may 2018 offers.